Found this image of an early work of mine in a catalogue forward by Robert Barnes who is currently Visiting Research Fellow, Classics & Ancient History, Australian National University. It’s been a long time since I’ve seen this as it’s now part of the Theirry Bouchard Estate in France. I was in the second year of my undergraduate in the Graphic Investigation Workshop at CSA with my extraordinary lecturer Petr Herel. Still more tracks from the past. Found in a 2011 edition of ‘Raised Bands’ (Bookbinders Guild). What was nice is that again as in the above instance I got to see a shot of ‘Tales for Two’ which was part of my graduate exhibition in 1989. I haven’t seen it 1990 when it was included in GIW collection and subsequently in the Menzies Library Rare Book collection ANU. 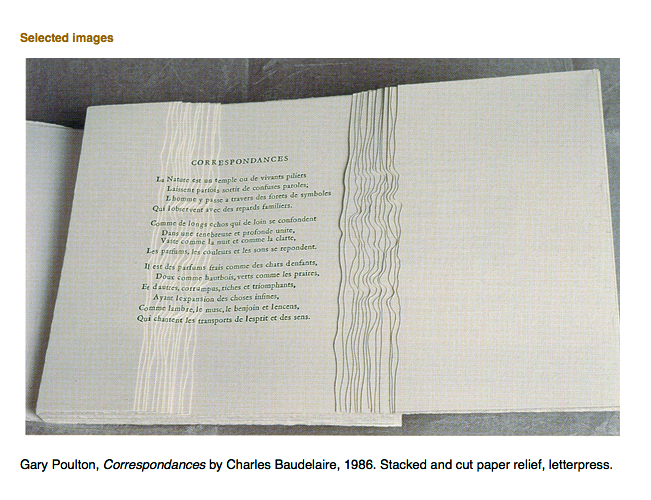 Bound in calf skin, the book consisted of images constructed by erasing text from each page. The erased text + paper powder was stored in a glass jar that was exhibited with the book. The concept dealt with the erasure and reconstruction of childhood memories. 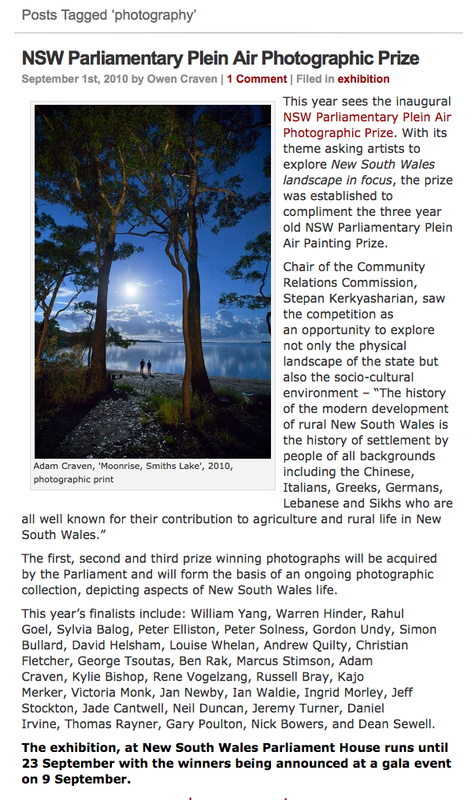 With the removal of, and failure to, archive the NSW Parliamentary Plein Air Photography Prize website by the current Liberal State Government, no record of the finalists or the event exists except for this web entry. I was fortunate enough to be among the finalists for the inaugural 2010 prize. My entry sold on the opening day.